1. Preheat the oven to 170°C, gas mark 3. Line a large baking tray with baking parchment. Stir together the jumbo oats, oat bran, pumpkin seeds, olive oil, maple syrup and a pinch of salt in a large bowl, tossing until evenly coated. 2. Spread the granola out on the lined tray and bake for 25 minutes, stirring occasionally to ensure the mixture browns evenly. 3. Stir in the dried cherries and linseeds and bake for a further 5 minutes until the granola is golden brown. 4. Allow the granola to cool completely — it will crisp up — then transfer to airtight jars or containers. Store in a cool, dark place for up to 2 weeks. Delicious served with fresh fruit such as figs, pomegranates or cherries and soya yogurt alternative. 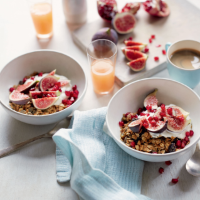 You can vary the seeds and berries in this delicious granola - try sunflower seeds, dried blueberries or chopped nuts such as Brazil nuts or pecans. This recipe was first published in Wed Dec 23 15:41:00 GMT 2015.